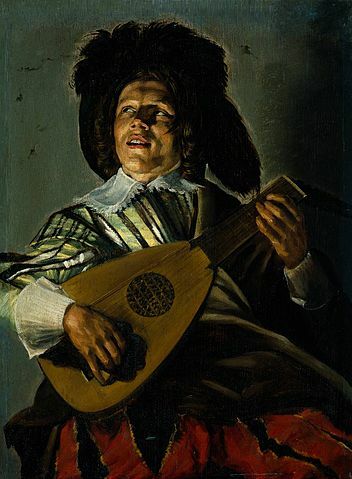 “The Serenade.” (1629) Artist: Judith Leyster. Public Domain. According to the article, most (though not all) katydid species alive today have asymmetrical forewings. Males in search of females produce noisy calls across a range of frequencies by scraping a toothed vein, called the stridulatory file, on the left wing across another vein (the plectrum) on the right wing. A. musicus, in contrast, had large symmetrical forewings (each with a stridulatory file) that worked together to produce pure-tone “musical” songs at a low frequencies that could be heard over a long distance close to the ground. Like extant katydids which make pure-tone music, A. musicus probably did its serenading at night, the article states. The Curiosity Dispensary is an A to Z assortment of intriguing research news designed to provide readers with more benefit than, say, a dose of Dr. Dyott's anti-bilious pills or a slathering of quicksilver ointment. It is created by Susan Frith, a freelance writer in Orlando, FL. If you would like to suggest a topic for an upcoming blog, please email Susan at susanfrith@earthlink.net. For more information about Susan and her writing services, please see her website Susan Frith, Wordsmith.